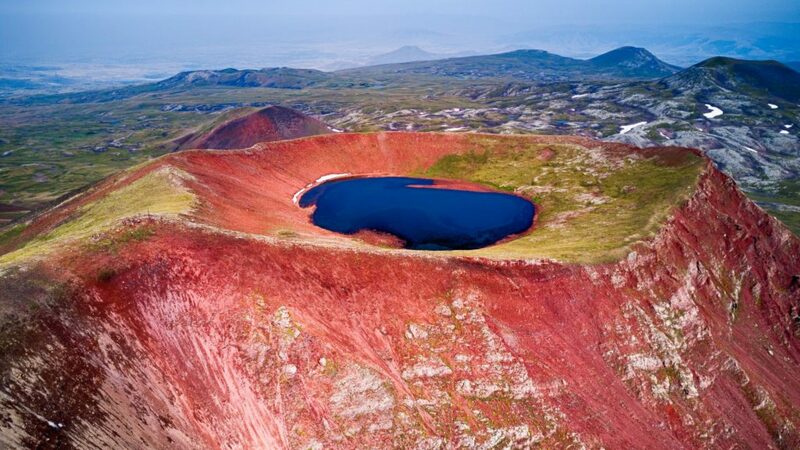 The Geghama Mountains are an imposing chain of volcanic domes that bisects Armenia from north to south. For most of the year they are impenetrable due to a thick layer of snow. But come June, as snow starts to melt, the country’s tent-dwelling Yezidi nomads drive their cattle from lowland plains to graze beneath the azure skies of high summer. These are among the most remote and uninhabited parts of the Lesser Caucasus mountains, which stretch from the Black Sea coast of Georgia to the River Arax on the border of Armenia and Iran. And it is the perfect place for an adventure. Living on and off in Armenia, I’d been staring at these snow-capped peaks for too long, dreaming of grabbing my pack and heading off to see what I would find. These mountains are ever-present: every road trip reminded me that I had not yet explored them. This year I decided to do it: I would traverse the Geghama range from north to south and climb the highest peak, Azhdahak, along the way. Doing so would tick off a long-standing personal ambition, but the expedition would also serve a greater purpose. In 2015 I’d been struck by the notion of building a long-distance hiking trail along the entire Lesser Caucasus range through Georgia and Armenia, enabling a journey through 1,000 miles of rugged terrain in one of the world’s most fascinating regions. Completing this key section of the route would go a long way towards making the Transcaucasian Trail a reality. Ben dropped us off in Georgina, our beloved Land Rover, at our starting point near the edge of Lake Sevan. My partner in adventure Leon McCarron struggled into his pack and began complaining about the weeks’ worth of food and gear he’d shovelled onto his shoulders. I told him to stop moaning and start walking because it was already midday and we had a bloody long way to go. Two days of walking got us beyond the ploughed fields and ranches to the first cluster of red, rounded cinder cones that define the ridge. We made camp beneath Mount Tas, and on the second day rounded the shoulder of Mount Shishdebe to reach Lake Akna, the first big milestone on our route. Even after just a few dozen miles, our muscles were easing into their task, and despite the elevation gain we already felt lighter and stronger. The landscapes here were sparse, clear, expansive. I took an evening swim in Akna’s ice-cold waters. Mount Azhdahak reared its head in the distance. This 11,801-foot monster dominates the range, its summit often obscured by swirling black clouds that hammer the mountain constantly. These electrical storms were no joke: at least one local guide had been struck by lightning on the slopes of Azhdahak in the last couple of years. A lone figure on horseback drove a small band of cattle down to drink from the opposite bank. Mountains blocked our view eastwards, but the steppe ran unobscured down to the west, where the shattered rocks of old lava flows disappeared over a low horizon, braided with deep ravines scoured over millennia. Beyond was haze, turning orange and red with the setting sun. Our bodies were reawoken, our minds cleared after the stresses of other all-consuming projects back home, and all was well in the world. The next day took us rock-hopping along meltwater streams hemmed in by steep slopes of pink volcanic pumice. Passing the crunchy remnants of snowdrifts that persisted in the hollows, we were eventually spat out at the foot of Azhdahak itself. A partial circumambulation brought us to the foot of the northern approach to the summit, and as the darkening cumulus began to swirl above us, we chose a sheltered hollow in which to pitch camp before the morning’s ascent. And it was a good thing we did. The rumbling began at sunset, accompanied by threatening splotches of rain. We took cover inside our tent, and within a few minutes it had started to pour in earnest. Thunder erupted in echoing claps that bounced around the towering slopes, and as darkness fell outside, our little tent was illuminated by the stuttering flashes of a great electrical storm that began to bombard the peak. I retreated into the luscious folds of my sleeping bag, pulled my hat over my eyes and ears, and decided that if I was going to be struck by lightning later tonight, I might as well get some sleep. The next morning I awoke, unharmed and delighted: there are few better ways to begin the day than by being alive in the first place. I elbowed Leon until he woke, then began our pre-dawn pack-up routine. The climb wouldn’t be a long or technical one, but the prevailing weather patterns would make an early morning summit a safe goal to aim for. Clambering among the rock with not a soul to be seen, I found myself comparing this experience with any number of peaks I could have climbed in the UK. There, there would have been a laboriously-built stone footpath, indicated clearly on an OS map; a summit cairn or shelter, and a car park and probably a pub at the bottom in which to dry out and warm up – oh, and other walkers. Here, it had taken three days just to reach the base of the mountain, navigating using home-printed Russian topographical maps made by the Soviet military and last updated in 1972. I hadn’t seen another human for over 24 hours, and there sure as hell wouldn’t be a pub on the other side. There was, however, a defined path from the crater’s edge to the summit itself, where a large metal cross had been erected, both as a lightning conductor and a reminder of one’s location firmly within Christendom. We gazed out from our hard-won vantage point, from where it seemed we could see not just the whole of Armenia but also the peaks of neighbouring nations. And after days of peering into the westerly haze, we finally spotted the lopsided white hump of Ararat itself, floating in space, easy to mistake for a cloud but for its unmistakeable shape: the sacred mountain of the Armenian people. We picked our way down the steep southern slopes. The land opened out into a tangle of meltwater rivers and interlocking drainage basins, the riverbeds lined with rock, the flats carpeted green, the nooks detailed with slivers of persistent white snow, all beneath a shimmering sky. Not a town, city, or road was visible; not a sound to be heard but the creaking of our packs and the wind whipping about us. The sheer expansiveness of the place conjured memories of the Patagonian and Mongolian steppes, and I boggled that this tiny nation in the South Caucasus, just a quick hop away from Europe, could serve up such wildernesses. The land south of here was less explored still. Groups climbing Azhdahak inevitably turned west after the summit, hiking down and out via Garni gorge and hot-footing it back to Yerevan. I could not find any records of anyone having gone for a full, unsupported traverse on foot from the northern tip of the range to the Selim Pass at its south-eastern extent. People had done it, of course. I’d sent a similar route plan to an ambitious young Englishman called Val Ismaili, who had used the data to traverse the range two months earlier. He had done so alone, with no command of the Armenian language, and with a lot more leftover snow to deal with. This was part of his attempt to hike the entire prototype route I’d designed for the Transcaucasian Trail’s Lesser Caucasus leg, walking some 1,000 miles from the southern border of Armenia to the Black Sea in Georgia. He’d been due to complete his pioneering trek a couple of days after Leon and I had set out. I wondered if he’d made it? The final challenge would be a traverse of Mount Spitakasar, the White Mountain: a formidable pile of sheer cliffs and scree slopes on the edge of a gorge that drained out onto the plains below. A traverse to the east would involve a lengthy detour across open land, but our Soviet maps showed an impossible-looking track that followed the contours through the cliffs to the west. So many of these tracks had disintegrated and vanished, and this one appeared on no modern map I’d consulted, nor on the aerial imagery I’d scoured for clues. Would there still be a way through, 45 years after the original trail was last mapped? We got lucky. After clambering our way up steep, rocky slopes, we crested a spur and found the clear remains of an old trailbed. The tiny path wound its way along the side of the mountain, and as we followed it, the cavernous ravine of Khosrov Forest – by many accounts the world’s oldest nature reserve – opened up below us. The mountain lived up to its name, too: the rock we crossed was a blinding white, punctuated with streams fed by the last of the melting snowpack, the occasional mound of horse droppings hinting as to why this track had not yet dissolved into the mountainside. Emerging onto gentler ground, we passed through fields of twinkling obsidian and plagues of newly-hatched crickets before regaining the central ridge of the Geghama range. The highest and toughest part of this trek was over. Descending from the ridge happened gradually. The fierce peaks grew distant and were replaced by steppe-like hills and plains. Rivers grew broader as tributaries joined forces to drain water off the plateau, east to Lake Sevan and west into the chasms of Khosrov. Nomad encampments grew more frequent, serving as weather monitors and providing intel on nearby freshwater springs. As they did, the jaw-dropping landscapes were replaced by heart-warming hospitality. Not a camp did we approach whose inhabitants did not invite us for a coffee and a chat, often also plying us with homemade cheeses, yoghurts, and creams. The Yezidis of Armenia, they told us, still feel an ancestral connection to their brethren who live nowadays in Kurdish-dominated parts of Iraq, Syria and Turkey. But they are wholeheartedly Armenian too, speaking both their own distinct tongue and the national language, but to all intents and purposes integrated in this otherwise monocultural nation. Fording ever-larger rivers and spotting the sharp glints of cars passing on distant roads, I felt the end of the trail drawing near. Making this journey had been an ambition for many years, and in proving it possible, we had also proved it repeatable. We had tracked the entire journey, mapping not just the trails we’d followed but water sources, nomad encampments, lookout points and prime wild-camping sites along the way. Now I could assemble all of that data and information into a trail guide for the next hiker who decided to tackle the Geghama Mountains – perhaps as part of a longer adventure on the Transcaucasian Trail. If you fancy tackling this route as part of a group next year, Val (the chap who first hiked the full 1,500km route) has teamed up with my friends at Silk Road Adventures to lead a 10-day Geghama Mountains expedition in July 2019, of which 15% of the profits will be donated back to the TCT. Big thanks to Alpkit and Firepot Food for supporting this scouting and mapping expedition with truly excellent ultralight outdoor gear and delicious dehydrated meals, to Leon for additional photography, and of course to Land Rover for continuing to support my work in the Caucasus. Great story, great trek – tempted! And Hi to Leon. I think you’d absolutely love it!